A statue has been unveiled in Viewpark to 'Lisbon Lion' Johnstone. 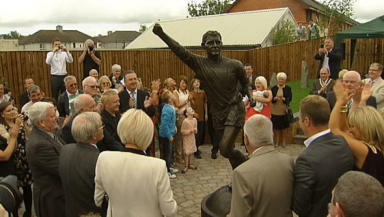 A statue remembering one of Celtic's most famous players has been unveiled in his home town. Jimmy Johnstone - known as Jinky - was one of the team's famed Lisbon Lions and a statue had previously been placed outside Celtic's ground. Johnstone died in 2006 and now a memorial garden, including lifesize statue, has been officially opened. The garden and statue are in Viewpark, Uddingston, and family and friends were among those who attended the official unveiling. The funding for the statue and memorial gardens has been raised in the Viewpark area and surrounding districts, along with money from supporters around the world. The former player was diagnosed with motor neurone disease in 2001 and excess cash raised was presented to Motor Neurone Research. The gardens are just 200 yards from Johnstone's childhood home, on the former site of his primary school, St Columba's.